Apparently we are 1/3 of the way through with only ~500km to go yay. Hard day today. Very sore feet (thank you, Inov-8 bastards) and very hot. You soon get a Camino tan even with multiple sun screen applications ie 3rd degree burns down your left hand side. 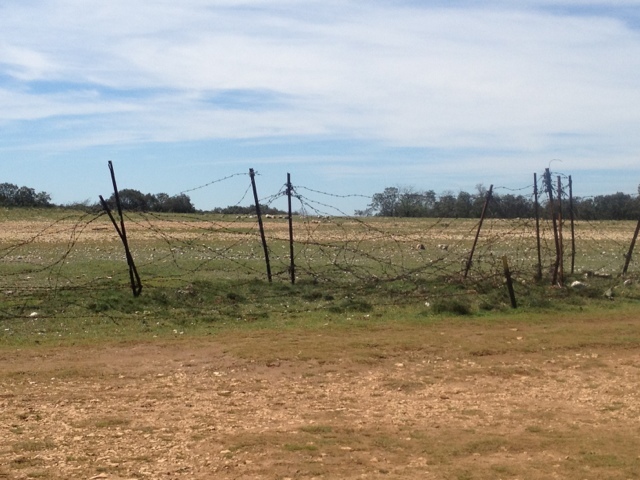 First part of the day is walking on very rocky ground reminiscent of a barren Greek island all the while beside barbed wire entanglements (see pic) This is protecting a military ground where we could hear small arms fire all morning. The only military presence I saw was three 4wds driven by unshaven scruffy looking uniformed youths that seemed to drive at speed in circles through puddles whilst honking their horns at the female pilgrims. Judging by there driving skills, appearance and discipline I'd say now would be a good time for the Basque to make a play. We got lost for the first time today. The Camino on approach to Burgos gives you 2-3 options we wisely chose the 4th and ended up in the middle of a farmers field just walking towards a mobile tower that we hoped was attached to the next town. The entry to Burgos is pretty tedious. Kms of airport or industry followed by Kms of high density living varying from Ghetto to 70s dull. As usual there is an old part of the city where we are staying and this is very pleasant. Rest Day tomorrow. I'll try and buy new Salomon trail shoes. May be they will last for more than a couple of weeks. "We H-8 Inov-8". Spread the word. view from the trench into no mans land. Mum just forwarded your blog address. I love reading about your (punishing) journey. I hope you find some new shoes. Keep safe and have fun.